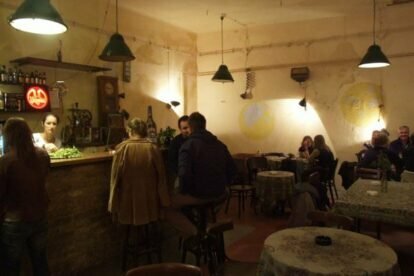 Pótkulcs is a bar, club and restaurant popular with the bohemian crowd, full of laid-back vibes, but rather crowded sometimes. Located a few minutes’ walk from Nyugati train and metro station, it has a garden completely separated from the street by a wall, as well as indoor seating – and some of the fussball tables so ubiquitous in these kinds of places. Personally, I find the garden to be my favorite part of the locale. There’s nothing objectively special about it, but it’s cozy, charming, and has just enough grass that isn’t covered by chairs and tables. In fact, it has such a nice ambiance that once I’ve stayed there late at night just to watch a game of Bridge unfold – and I can’t even play Bridge! One thing that separates Pótkulcs from many similar venues is that you can get some hot food here, making it a good stopping point on a late night crawl. You’ll need to walk a few minutes from and back to the nearest public transport, but that has the added bonus of clearing a bit of the alcohol haze from your head.